Ricca Louissaint is surrounded by her husband Roosevelt Louissaint and their three sons -- Gabe (far left), Elijah and Matthew (front) -- on graduation day. Illinois needs more college-educated workers and can't meet that goal with traditional students. Here's what some schools are doing to attract adult learners. Ricca Louissaint spent 10 years in college without earning a degree. It wasn’t that she didn’t take college seriously. Like many moms, she just couldn’t untangle herself from more urgent obligations. As mom to three boys — two of whom are on the autism spectrum — Louissaint’s list was lengthy: “My children and (their) special needs, and my spouse, and the cat, and the dog, and three fish, and the mortgage, the grass, whatever,” she says. Her chance came accidentally in 2011, when she was helping her oldest son, Gabe, enroll as a freshman at South Suburban. Noticing flyers for a new “dual degree” program, Louissaint asked if her son was eligible. The counselor told her that Gabe didn’t yet qualify — students need 12 hours of credit to apply — but mentioned that Louissaint actually did. Next thing she knew, she was in the express lane of higher education. Louissaint was assigned a “transfer specialist,” who helped her choose classes to fill the gaps in her academic record. 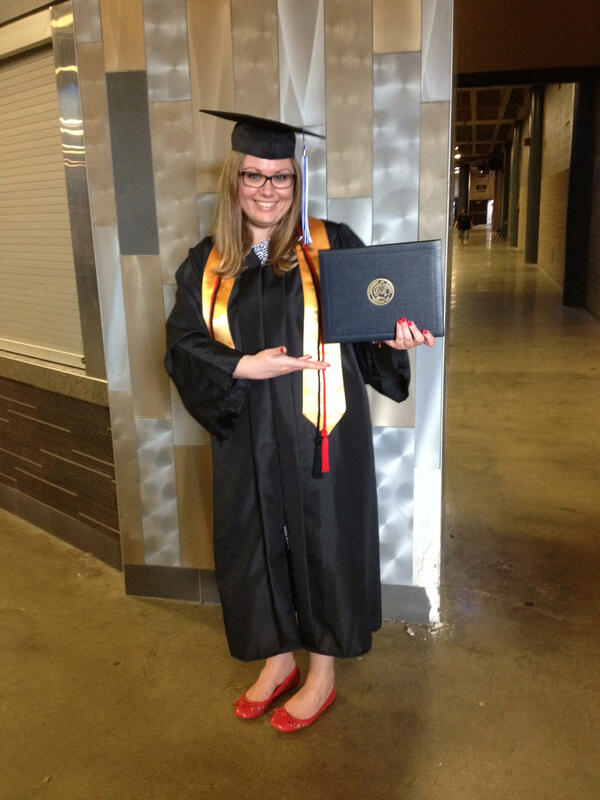 Within a year, she had earned an associate’s degree. Her grades in the dual degree program gave her automatic entrance to Governors State University, where her credits counted and she earned a full-tuition Honors scholarship. By December 2014, she had earned a bachelor’s degree in psychology. And she’s not done. At age 46, she’s studying for the LSAT exam and will attend law school. For Louissaint, the dual degree program changed her life. But for the state of Illinois, her story amounts to one down, thousands more to go. Under the Illinois Public Agenda for College and Career Success initiative that began in 2009, the General Assembly and the Illinois Board of Higher Education (IBHE) set a goal to have 60 percent of the state’s workforce holding some form of college degree by the year 2025. Just 43 percent of those in Illinois’ workforce currently hold a degree. Although that’s slightly better than the national average, it’s not where the state needs to be for economic health. It’s also not the kind of statistic that moves quickly. In fact, James Applegate, director of IBHE, says Illinois has no hope of achieving that goal using conventional methods. So IBHE is focusing on the thousands of Illinois adults who have never been to college, or who have earned credits but stopped short of getting a degree. The goal isn’t about giving more Illinois adults a lovely certificate to hang on the wall; it’s about attracting and keeping businesses in the state. A recent analysis by ReadyNation found that 150,000 jobs are standing open in Illinois because of a lack of qualified candidates, and Applegate cites studies suggesting that, over the next five to 10 years, more than two-thirds of available jobs will require college credentials. 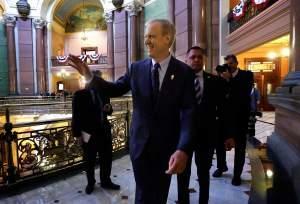 He says a better-educated workforce could help the state’s financial crisis. Furthermore, a college-educated workforce translates into cost-savings on big-ticket items like criminal justice, public assistance, unemployment benefits and Medicaid, Applegate says, since college graduates tend to smoke less than people with no post-secondary education. Some schools are more receptive to adult learners than others. According to a 2014 U.S. Department of Education report, more than half the students at Governors State and Chicago State University were 25 or older, and more than 20 percent were at least 40 years of age.Northeastern Illinois University and University of Illinois at Springfield also had significant numbers of adult students. By contrast, at the University of Illinois’ flagship campus at Urbana-Champaign, a scant 2 percent of students were 25 or older. The school has more than 1,400 Registered Student Organizations, but none specifically targeting adults. Dana Papanikolaou earned her associates degree and was halfway through her junior year of college when chronic health problems derailed her academic career. Eventually, she decided the best way to continue her education would be online, and she spent months looking for a reputable university offering a bachelor’s degree in English. It turned out there weren’t many schools that met her criteria. University of Illinois’ Springfield was the only one out of the schools three campuses that did. Dana Papanikolaou wears the gold stole denoting her position as marshal of the English graduates at UIS commencement ceremonies. Papanikolaou, who’s 30, lives in a northern suburban of Milwaukee, and she completed all her coursework from home. The trickiest part was a required communications class, which included public speaking. Nervous and mindful of her audience’s mood, Papanikolaou’s first speech was on the pleasures of living in Wisconsin. It focused on popular festivals and sports teams. But that level of frivolity wasn’t typical of her online education. Class discussions happened through Blackboard,where students were required to post questions and answers. There was no back row in which to hide; participation was required. This format gives students time to research their answers and fosters deeper discussions, Papanikolaou says. UIS has a long history of catering to adult learners. Originally called Sangamon State University, it was one of a few dozen “senior universities” established in the late 1960s and early 1970s, mainly to serve community college transfer students. Acknowledging that the SSU/UIS student population was, by definition, older than “traditional” students and probably juggling jobs and families, it launched its first online course in 1997, and has earned a national reputation as an online educational leader. As of 2013, about 30 percent of the approximately 3,000 UIS students are enrolled only in online courses. The typical age is 34: most are women, and most begin with about 60 hours of credit earned at community college, according to Vickie Cook, director of the Center for Online Learning, Research and Service at UIS. Ninety percent have full-time jobs and families, and many live so far away, they will never even know that their alma mater is a small campus surrounded by cornfields. Governors State University, where Louissaint earned her bachelor’s degree, has specialized in educating adult learners since it was founded in 1969. It still leads the state’s public universities in its percentage of adult learners, with 64 percent of its approximately 3,100 students older than 25, and 23 percent older than 40. Only 14 percent take classes exclusively online. The campus itself is designed to accommodate grownups with busy lives and full-time jobs. There’s a large daycare center located just far enough from classrooms so that parents can drop off their children, then focus on getting to class. But when Elaine Maimon, president of GSU, is asked what her school does to attract and retain adult learners, she doesn’t mention the award-winning daycare center or the cafeteria Starbucks. Instead, the first thing she mentions is GSU’s unique attitude toward whatever an adult learner has been doing during his or her years outside of a classroom. That means not only boosting their confidence about their ability to master the work ahead, but also through a “prior learning assessment” through which students receive credits by participating in a formal portfolio process and taking nationally standardized exams. “Military credits, things like that,” Jim Howley, director of student academic affairs, says of the experiences that can count toward a student’s degree. “Governors State has done that essentially since its inception.” Getting over the organizational hump of lining up those credits, seeing where they’ve been and what they’ve already learned, helps students figure out where they can go. To help adult learners tackle new course work, GSU tries to remove logistical barriers, scheduling classes and other campus functions to accommodate the lifestyles of grown folks with jobs and families. In the center of campus, there’s a large food court where everyone eats, so that students can bump into professors, staff, even the school president, over a meal — including an evening meal. Online courses help make schedules flexible, and 44 percent of GSU students take a mixture of on-campus, online and hybrid courses, which are online courses that have on-campus meetings, according to a 2013 U.S. Department of Education report. Maimon says that these options “reduce what I call the tyranny of the calendar, the clock and the car.” But particularly for older students, who may not be as comfortable with technology as the younger generation, some personal interaction with professors and other students helps, especially if the other students are also older. 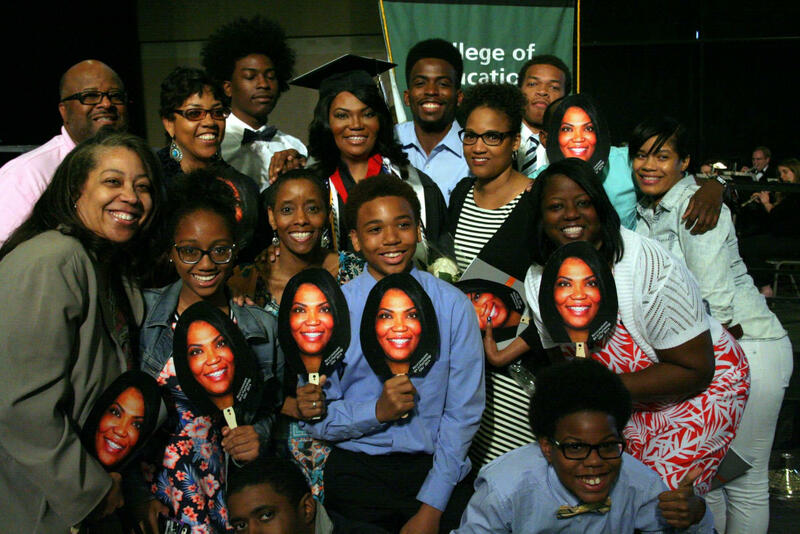 Louissaint created her own "fan club" by distributing fans with a photo of her face to her family, so that she could spot them in the crowd at the GSU graduation. Ricca Louissaint, who spent a decade with youngsters at a community college before the dual degree program introduced her to Governors State, felt that she had found her tribe the first day she came to campus. “When I walked in here as a junior… I felt like it was my own reflection. They looked like me. We had a respect and an understanding,” she says. Louissaint, though, realizes that in the real world, she will be competing with — and working with — people half her age. To test her skills, she applied for and won an internship with The Washington Center. She spent her last semester of school in the nation’s capital as an intern with a lobbying law firm. She didn’t just belong; she thrived. When the four-month internship was over, she was one of two students chosen by The Washington Center faculty and staff to deliver the commencement address at her cohort’s class graduation. She now realizes that she would likely still be floating through community college, with no direction, no degree. “Truth be told, the statistics show that the longer you are in school, the more likely it is that you will not complete a degree,” she says. GSU’s program, which has won national education awards, includes 17 community college partners and a $1 million endowment to provide scholarships. 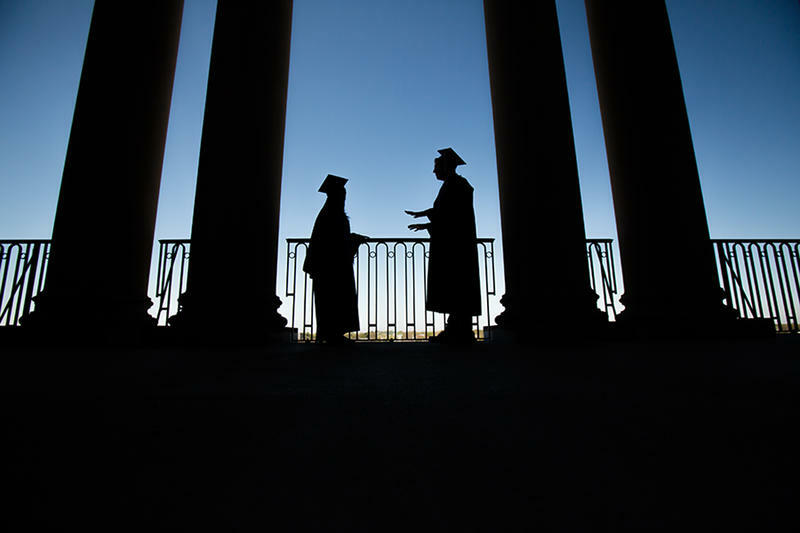 But as successful as the dual degree program is, it has yet to spread beyond Chicagoland. 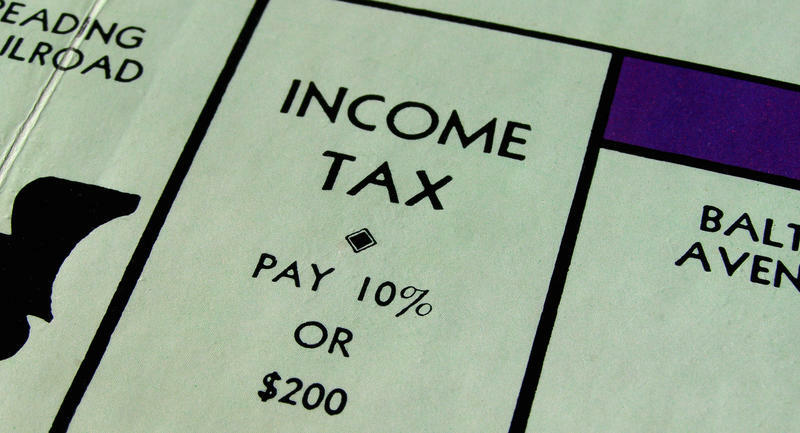 Commentary — Let’s be blunt: Illinois needs higher taxes. That statement might come as a shock to citizens under the illusion that all would be well, if state leaders would just cut all the wasteful spending out of the state budget. Illinois' elementary and high schools are operating as normal; funding for education was the only spending spared from Governor Bruce Rauner's veto pen. But universities are another story. They haven't gotten a dollar from the state since July. Collectively, Illinois' public universities educate some 200,000 students a year. Now, the campuses are "on the brink of serious operational damage." Governor Bruce Rauner’s budget proposal calls for cutting state higher education funding by nearly a third. But at the Illinois State Fair this week, Rauner turned back to his long-term goal of raising state funding for state universities. In an interview on WILL’s Closing Market Report, the Republican governor repeated the argument he made in his gubernatorial campaign last year --- that an increase in funding should come with a change in how that funding is spent.